Tops on our list of classic Christmas TV shows is Rudolph the Red-Nosed Reindeer. I think I could quote most of the lines and songs by heart. Get ready for a viewing party with this snickerdoodle recipe to make Rudolph cookies. Plus, easy peasy recipe for making your own reindeer food. These surefire hits in our home will hopefully become popular in yours. What are some of your holiday traditions? We like Elf on the Shelf, the Christmas pickle ornament, and driving around to look at holiday lights. Oh, and Rudolph the Red-Nosed Reindeer. It’s a quintessential holiday special that is must see TV in our home. We love cozying up under blankets, drinking hot chocolate, and singing along. What cracks us up the most is when Rudolph is talking to Clarice, and she suddenly launches into the song, “There’s Always Tomorrow.” It seems so random and out of the blue, and we cackle our heads off! FYI: Rudolph will air Tuesday, November 27, 2018 at 8 p.m. EST on CBS. Set your DVRs or tune in! Did you know? Fans are the reason the Misfit toys appear in the ending! In the original special that aired in 1964, Rudolph, Hermey and Yukon Cornelius promise to return to visit the Island of Misfit Toys, but that doesn’t happen. Fans complained to producers via angry letters, so the script was changed. In 1965, the special concludes with Santa and the reindeer delivering the Misfits to new homes. So that’s what a pre-social media movement looks like! Here are a few reindeer-centric crafts for the whole family that we hope you will find inDEERing. Combine Snickerdoodle cookies with a Wilton cookie/cupcake decorating kit, and cookie decorating becomes a cinch! The cinnamon in the Snickerdoodle recipe makes the cookie look like a reindeer enough so no brown frosting required! 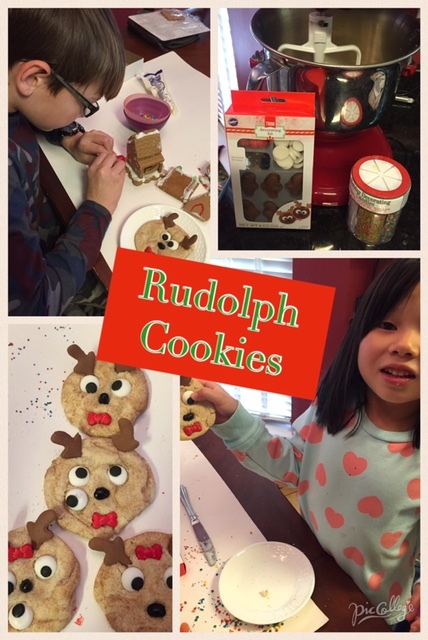 My BFF’s daughter shows us how to make reindeer cookies! 2. Mix 1 1/2 cups sugar, butter, shortening and eggs in large bowl. Stir in flour, cream of tartar, baking soda and salt. These cookies would be fabulous with hot chocolate. Coordinate your cocoa with this Wilton hot cocoa trimming kit. Sure to be an absolute hit. My crew had more fun making the reindeer look a bit funny with google eyes and offset antlers. That’s what I love about this process–creativity is limitless! Even our dog Millie was captivated (although I think she was looking for scraps). Another option would be reindeer cookie cutter. Even my dog couldn’t wait to snag one of these cookies. Next time, I’m going to make Rudolph dog treats! Handing out reindeer food is another Christmas tradition at our home. Reindeer food is designed to be sprinkled on the lawn for Santa’s crew. It’s not complicated either: we use lots of oatmeal, cookie sprinkles and magic edible glitter (or substitute colored sugar) to make our special concoction for the hardworking reindeer. Our elf even got in on the action making reindeer food. I found the burlap bags at TJ Maxx or you could use red or green decorative Ziploc bags or glass jars. Tie some pretty ribbon around the top. Don’t forget to print a reindeer food tag to tell them what’s inside! There are tons of free printables out there. The ones we used last year were from The TomKat Studio so go check them out! If time is limited, Santa’s elves also offer premade labels and jute bags. Spreading reindeer food on Christmas Eve is yet another family ritual we have, so it’s always nice to share those traditions with friends and family. What are some of your holiday rituals? Disclosure: This post contains affiliate links. They help keep me caffeinated and motivated to find new goodies to share. Thanks! Sherry Boswell is a participant in the Amazon Services LLC Associates Program, an affiliate advertising program designed to provide a means for sites to earn advertising fees by advertising and linking to Amazon.com.